Now that the gardening season has passed, lose yourself in the pages in some of our holiday garden book choices. Before you know it, it will soon be spring and time to put what you’ve learned to use in the garden again! 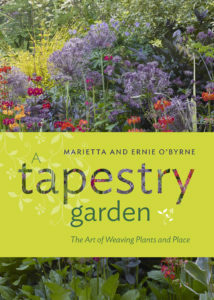 The garden tapestries as created by Marietta and Ernie O’Byrne, are best described by the subtitle of their book: “The Art of Weaving Plants and Place.” Nature constantly creates garden tapestries, but the process is less intricate, more natural, so to speak. A weaver makes a tapestry using fibers of different colors, woven into various forms, to tell a story. Nature uses plants of various species that will grow under certain conditions to tell an ecological story. Using 299 illustrations of varying size, accompanied by ample text in this 261 page book, Marietta and Ernie O’Byrne have explained how they use a combination of plants to achieve a certain mood, scene, or effect for the eighteen garden tapestries they display in this book. In one of the gardens entitled From the Kitchen Window, they have used two prominent trees as the focal point, and to achieve a peaceful mood have featured horizontal branching on those trees and others. Succession of bloom and variation of plant texture, among the shrubs and perennials, offers interest throughout the year. Bird feeders, strategically placed, act as sculptural elements within the space. As we analyze the various features used extensively in all of the tapestry gardens discussed and pictured, the major elements seem to be plant form and texture, succession of bloom, focal elements such as sculpture or by the use of certain plants with colored twigs, or by plant form such as a contorted nut tree in one of the gardens, or an actual sculptural piece in another. Variegated plants with bold as well as finite variegation are used extensively in the O’Byrne’s gardens as when impressionistic qualities are desired. Each of the eighteen garden tapestries presented has a lengthy, illustrated explanation of how the mood implied was created. Certain of the garden examples, such as For the Love of Hellebores, led to their changing their nursery from retail to wholesale, specializing in the genus Helleborus, with its many species and varieties. A plan of the farm with its various elements, from greenhouses for plant production to the eighteen tapestry gardens, appears on the inside front and rear covers of the book, to help us understand the set-up, and some of this may also be seen on www.northwestgardennursery.com. The gardens and nursery are in Eugene, Oregon, on a seventy acre farm that the O’Byrnes purchased in the early 1970s. In conclusion, a promo statement on the book jacket says: “The book is a visual feast of luscious combinations [of ] extraordinary plants….” Agreed! L. M. Montgomery’s deep connection to the landscape of Prince Edward Island inspired the writing of the beloved Anne of Green Gables series. 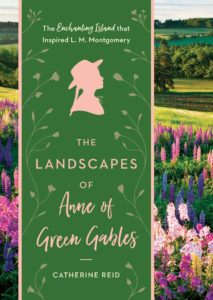 Catherine Reid, in The Landscapes of Anne of Green Gables, introduces the real places and people that set the stage for L. M. Montgomery’s work. Reid traces the similarities between Maud Montgomery and her iconic character, Anne. With many similar circumstances between their lives, it is when imagination and landscape merge that Anne and Maud’s shared sensibility are most evident. Anne and Maud both look to the natural world when needing to transcend a difficult or uncertain situation. Maud struggled with depression. Her journals suggest that turning to the beauty around her—and wrestling to find the right words to capture it—were an antidote that saved her again and again. It’s no wonder, then, that the landscape exerts such a pull on Montgomery’s readers. Using Montgomery’s journals, scrapbooks, and many archival and current photographs, Catherine Reid transports readers to the idyllic countryside of the book. Prince Edward Island in all its lush beauty gives Green Gables lovers a visual setting for Anne’s adventures. The blaze is intense and you are in the middle of the action. Ferguson’s extensive descriptions of the job of putting down a wildfire are intentionally overwhelming. 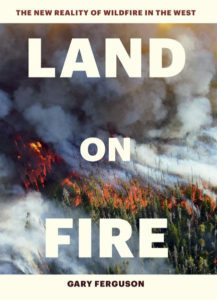 He details the latest research in analyzing threat level, coordinating the efforts of local, state and federal agencies, predicting the startling ability of fires to make their own weather and what needs to be done to reduce risk. Why has what once was a regular cyclical event become a regional disaster? Many native western plants are fire-followers as their seeds require the heat of fire to germinate. In 1988, Yellowstone National Park exhibited the regeneration expected. But well intentioned suppression of wildfires for 80 years has adversely affected the natural balance. With the natural burn cycle disrupted, the buildup of fuel loads from fallen limbs has created dangerous situations. While regular burns might have arrested their spread, insect pests like pine bark beetles have romped through forests leaving dead trees ready to ignite. Ferguson notes that the wildfire season worldwide lengthened by 18.7 percent from 1979 to 2013 due to warmer temperatures and more rain-free days. His final chapters outline what we all can do to reduce the risk. 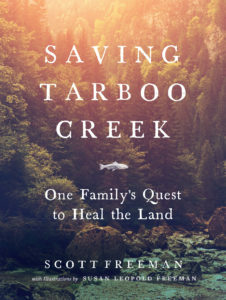 The Freeman family bought 18 acres of land in 2004 in Washington at an important time—just as the state of Washington and public and private groups were working to restore Tarboo creek as critical salmon habitat. Working together with these groups, they managed to turn what had been a drainage channel back into salmon habitat (they call it remeandering). In addition, they reforested the land around the creek and worked to eliminate invasive plants as well. How did they know so much about ways to accomplish this? Susan Leopold Freeman is Aldo Leopold’s grand-daughter. Many of you may remember Leopold’s epic work A Sand County Almanac about restoring land in Wisconsin and about the ethos that goes with caring for land. This same ethos (described as finding harmony with each other and the land) pervades Saving Tarboo Creek. It is present in each of the choices, which are separate chapters—that the author discusses, from the choice they make in selecting trees, to the choice they make in dealing with beavers on the land. This book is as close to a virtual walk through a garden as you can get. 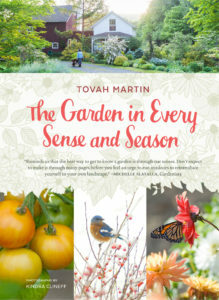 “The garden in every sense and season” will awaken your imagination. It was easy to get caught up in the moment of the Korean Spice bush in bloom, or the many descriptions of seed heads beginning to form for fall. Relating to your garden on many levels becomes a realistic possibility from the seasons, sights and scents all the way down to the function of your tools or the weight of a watering can you comfortably tote back and forth. This book brings common sense to the natural order of things. This book is a great resource to have when hunting for pollinator plants. Its paperback construction and simple format make it a useful reference book. 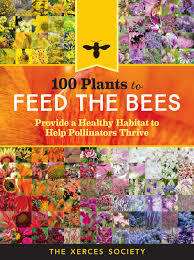 It is 90% plant description with 10% of the pages detailing the importance of pollinators. 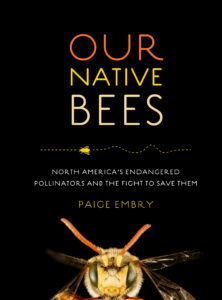 The book’s preface reminds us that ‘What’s Old is New.’ Conservationists and scientists have been criticizing the use of pesticides and praising the importance of insects for nearly 100 years. The one hundred plants described in the book include Native wildflowers, trees and shrubs. ‘Introduced’ trees, shrubs, herbs, ornamentals, and bee pasture plants (both Native and Introduced). Each pollinator-friendly plant appears in a 2-page spread that includes: the plant’s common and botanic names, its culture, several photos, pollinators it attracts (honey bee, native bee, hummingbird, butterfly or moth), uses in your garden and where it grows in North America. With this book in hand, you can do your part to choose plants that reward the environment as much as they reward you. 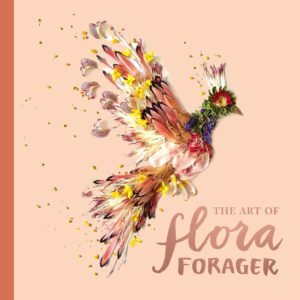 For those that know the work of Connecticut artist Ellen Hoverkamp, who preserves flowers by using a scanner, this book will at first seem similar. Some of the flower mandalas and other designs do remind me of some of Hoverkamp’s work. But the similarity ends there. For one thing, Bridget Beth Collins photographs her work. But that is just minor. Collins use of flowers to create works of art— literally, she re-creates paintings and portraiture in flower petals, leaves, twigs, bits of mushrooms, moss and lichen—as well as sea creatures, fairies, circus animals and just about anything else that strikes her fancy, is amazing. In re-creating Van Gogh’s The Starry Night, for example, she used blueberries as well as more traditional floral material. These fanciful works must be seen to be appreciated. Her “flower” art is truly amazing! Martha Stewart’s name is synonymous with a homekeeping empire but few remember that her first book, back in 1991, was a gardening book. 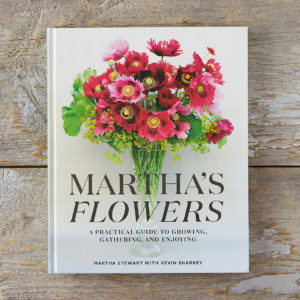 It’s obvious from this book that she still loves flowers and enjoys growing them. This book is divided into three parts: Signs of Spring, Summer’s Bounty and Early Autumn and within those divisions individual flowers are highlighted. Spring features the usual bulbs: tulips and daffodils but it also features more unusual choices like magnolias and rhododendrons. Summer features hydrangea, roses, including old roses and peonies. Autumn features sunflowers, rudbeckias and dahlias. Surprisingly there is no use of foliage, either by itself or as a design element in the Autumn section. But it’s not all just pretty pictures and gorgeous arrangements. There are short descriptions of how to grow each of the flowers, discussions with Kevin Sharkey of the individual flowers and ideas for arranging, and a section at the end on how to choose vases, tools and other practical considerations. There are even discussions about each of Martha’s homes and the choices she made about what to plant. The author, Nikki Jabbour, accidently stumbled on alternative vegetables from her Lebanese mother-in-law Noha. Nikki had planted snake gourds to use for Halloween decorations when Noha affectionately recognized them as a squash she grew up with in Lebanon. When a foot in length, they are cooked and enjoyed much like you would summer squash. 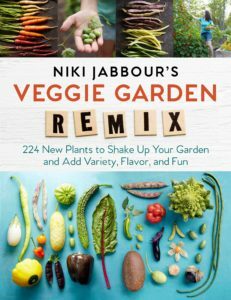 From that point, there was no stopping Nikki from experimenting with growing vegetables from around the globe in her Nova Scotia garden. The Veggie Garden Remix is sensibly organized. Each chapter offers alternate crops to try if you ‘like’ a certain vegetable. For example, if you ‘Like cucumbers?’ then you are encouraged to try cucamelons, West Indian burr gherkins or cucumber melons. Nikki also includes tips on how to prepare and enjoy your new edibles. This is a great book for the adventurous gardener and includes practical pointers on getting the most from your vegetable garden regardless of how unusual or ordinary the varieties.